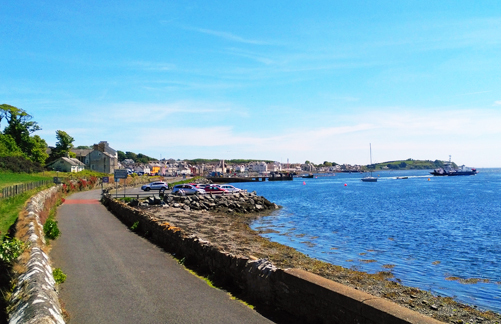 Portaferry is a beautiful little town perched at the edge of the narrows that separate the Ards Peninsula from the 'mainland' Lecale. From the shorefront you can see the little village of Strangford perched on the opposite shore. Strangford ferry links the two sides, allowing you to progress to Strangford village, Castle Ward, and on to Killyleagh or Downpatrick and the Mourne Mountains. The ferry sails from Portaferry every quarter-past and quarter-to the hour; it sails from Strangford village every hour and half-past the hour. Portaferry is home to the recently restored Portico Heritage Centre, Exploris Aquarium, a Norman castle, and a fine market house. And while you're there, make the effort to drive up Windmill Hill to enjoy breath-taking panoramic views of County Down, Strangford Lough, and the Irish Sea. Ballyquintin Farm - This grassland walk is situated at the very tip of the Ards Peninsula at the mouth of Strangford Lough. The coastal path passes through farmland, rocky shore and beach owned and managed by the National Trust, and also through a National Nature Reserve owned and managed by the Environment & Heritage Service. From the walk you can take in views across Strangford Lough to Killard Point and across the Irish sea to The Isle of Man on a clear day. Bird species to look out include skylarks, linnets, peregrine falcons, buzzards, kestrals and Brent geese. The site consists of coastal grassland, a habitat which includes some sensitive and rare flowers including orchids and wind- dwarfed Burnett rose. Also look out for Irish hares and common seals which can be seen on the rocks at the mouth of Bar Hall Bay. Derry Churches - These ruined churches are situated one and a half miles north east of Portaferry on the Tullymally Road, east of the A2 to Cloughey and are signposted from Portaferry. Evidence dates these two small churches as being pre-Norman and are associated with Saint Cumain. A small early cross and carved stone are set in the larger church and may be viewed. Access is by a gate at the roadside and along a fenced path. There are no signposts at this entrance, and no layby for parking. Kilwarlin / South Rock Lighthouse - With the financial and lobbying support of Lord Kilwarlin, 2nd Marquis of Downshire, a grant of £1,400 was obtained to assist in the building of a lighthouse on the South Rock by resolution of the Irish House of Commons on 14 November 1783. However, it was not until 1793, ten years later, that construction began. The lighthouse was designed and built under the supervision of Thomas Rogers, lit for the first time on 25 March 1797 and named the 'Kilwarlin Light' in honour of the Marquis. Only two 'wave washed' lighthouses, the Eddystone and Bell Rock lighthouses, had been built earlier. The Belfast Newsletter of 19 July 1793 reported;'Mr Rogers an emininent artist has now begun the lighthouse on the South Rock, under the patronage of the Earl of Hillsborough. The several lighthouses now in the Kingdom have been viewed by Mr Rogers preparatory to their being improved'When construction of the Kilwarlin Lighthouse began in 1793 plans to use finished stone blocks from Wexford had to be abandoned after the first supply vessel sank on passage and the second was driven well off course onto the English coast. It was then decided to use local granite from a quarry near Newry, County Down, and a squad of 20 masons, 18 labourers, 2 smyths and 2 foremen were employed. They were based in the townland of Newcastle on the Ard's Peninsula (Note : not the town of Newcastle, County Down) where a masonary platform and a short quay was built, from where the construction materials were transported to the South Rock. The 'Kilwarlin Lighthouse' (or the South Rock Lighthouse) remained lit for 80 years, until 1 April 1877, when it was replaced by a manned light vessel, named the 'South Rock Light Vessel', positioned about 2 nautical miles further east of the Kilwarlin Light. The light vessel was eventually automated and the crew withdrawn on 31 March 1982.The lighthouse still stands. Millin Bay - located close to the bay shore is a Neolithic burial site which is over 5,000 years old. You can see the standing stones. The site was excavated in 1953 so there is quite a bit of information about it. Location: try BT22 1QB on your SatNav, on the Irish Sea coast, take the shore road south from Quintin Bay: it is poorly signposted, half way along Millin Bay. Access: park carefully on the road, and use the fenced pathway to the side of the private residence. Portaferry Visitor Information Centre - situated beside Portaferry Castle, a 16th century tower house overlooking the Narrows of scenic Strangford Lough, and a short walk from the town centre, the Visitor Information Centre provides you with local and national visitor information. Staff can help you plan your day out, short break or holiday in the area and offer information and advice for the next leg of your journey. Buy tickets for many local events including Experience Ards and North Down Tours or pick up a souvenir of your visit in the well-stocked shop. The Centre is also home to the Loft Gallery and the established “Art in the Loft” exhibition series showcasing the work of local artists, craftspeople and makers from the Borough and beyond. During July and August, the Centre hosts a series of family fun activities each Saturday afternoon so come along and join in the fun for free. Portico Arts & Heritage Centre - located near the square on Meetinghouse Street, Portico is a multi-purpose venue for everyone to use. It will host cultural, educational and heritage events and activities to include film shows, concerts, exhibitions, literary events, talks and much more. The Meeting Room and Auditorium can be hired for public events such as concerts or conferences, or privately for weddings, funerals or family events. SeaGen Tidal Stream Generator - sitting in the middle of the narrows between Portaferry and Strangford village, and a little south of the ferry crossing, you can't miss this impressive piece of engineering that generates sustainable electricity from the strong in-out tidal flow at the narrows. SeaGen is the world's first large-scale commercial tidal stream generator. Installed in 2008, it generates 1.2MW of electricity for almost 20 hours each day - enough to power up to 1,000 homes. When it is raised for maintenance, you can see the wide arm that holds the two turbine blades that slowly rotate against the flow of water and generate the electricity. The power transformers are sited on the Strangford-side of the narrows. The Holy Well is signposted off the Ballyquintin Road - it's a bit tricky to find: try BT22 1RG on your SatNav and look out for a sign at a lane leading up a steep hill. Strangford Ferry - Sailing every fifteen minutes from one side to the other, the Strangford Ferry is a great way to enjoy views of the lough and the offshore views of Portaferry and Strangford village. You don't have to take your car: travel as a foot passenger and get the wind in your hair. Please note: the ferry only accepts cash payments. The ferry also allows for a slightly closer view of the SeaGen tidal stream generator, which sits a little south of the ferry crossing right in the middle of the narrows. Windmill Hill - stunning panoramic views across Strangford Lough and all around as far as the Isle of Man and Scotland, certainly worth the effort. The old windmill stump is accessible, and you can climb to the top and peep through one of the little windows. But excellent views can be enjoyed from the roadside. Location: you can see it from the town, it's the high hill with a windmill stump on it just a short distance to the south. Access: accessible by foot and vehicle; there is a small lay-by at the summit of the road with a viewing point.